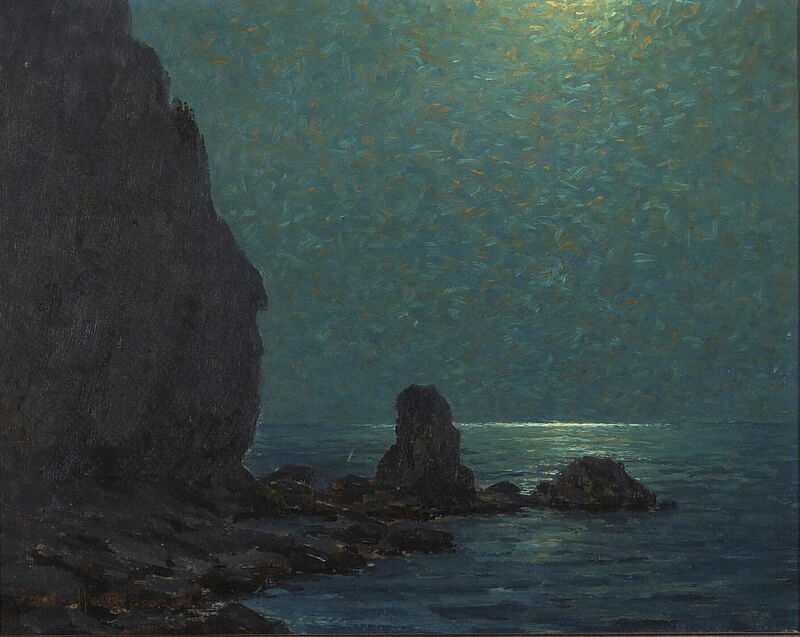 Granville Redmond (1871–1935), Catalina Island Coast under a Moonlit Sky (1920), oil on cardboard, 25.4 × 35.6 cm, Private collection. Wikimedia Commons. By 1850, nocturnes were in fashion, and moonlit views of the coast were proving very popular. A northern European school, spanning Germany and the Nordic countries, had been most successful with them, particularly Caspar David Friedrich and JC Dahl. However, Peder Balke had been less successful, and the vogue seems to have passed by the time that the first Impressionist landscapes were shocking the public. 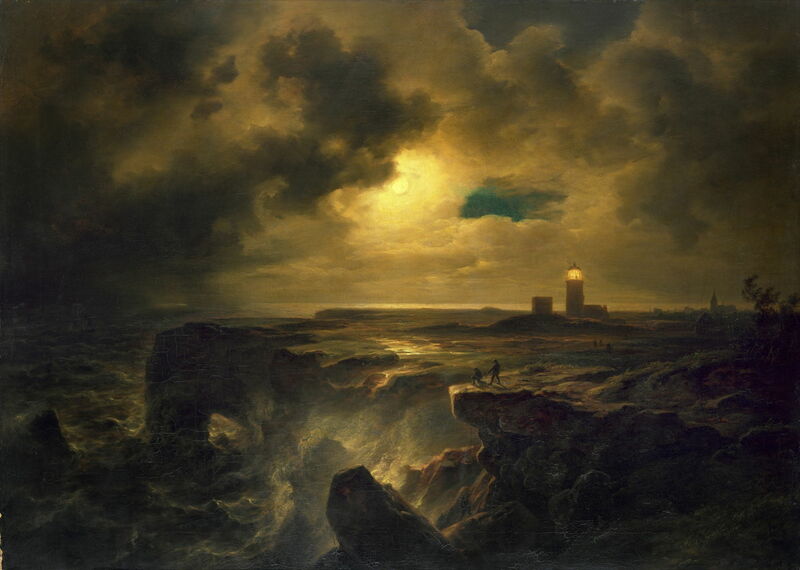 Christian Morgenstern (1805–1867), Helgoland in Moonlight (1851), oil on canvas, 83.3 × 118.6 cm, Hamburger Kunsthalle, Hamburg, Germany. Wikimedia Commons. Christian Morgenstern (Christian Ernst Bernhard Morgenstern, to distinguish him from the slightly later author of similar name) was in the generation after Dahl, and another major artistic influence in the development of Realist landscape painting in Germany. He painted a few nocturnes, of which his Helgoland in Moonlight from 1851 is the best, and most dramatic, coastal view. 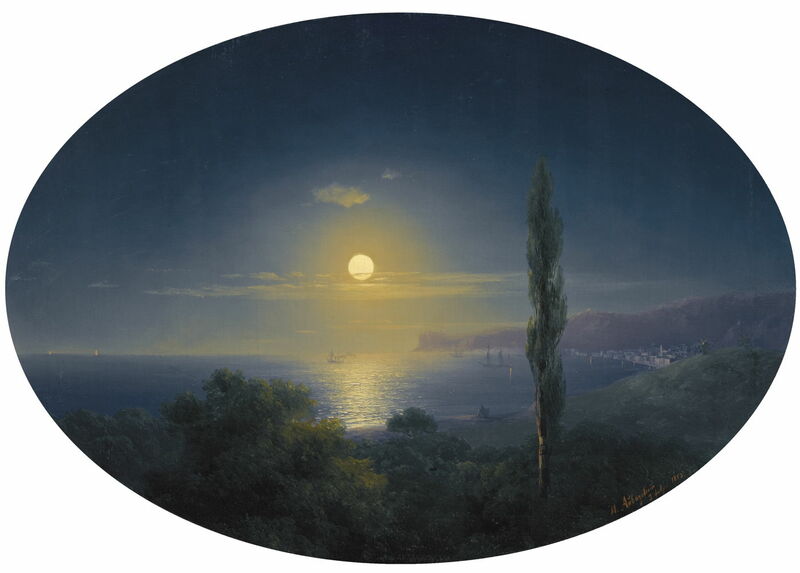 Ivan Aivazovsky (1817–1900), Crimean Coast by Moonlight (1853), oil on canvas, 40 x 56 cm, location not known. Wikimedia Commons. The nineteenth century’s greatest and most prolific marine painter, Ivan Konstantinovich Aivazovsky or Hovhannes Aivazian as he was baptised, painted many nocturnes, of which this view of the Crimean Coast by Moonlight (1853) is surely the most serenely beautiful. Ivan Aivazovsky (1817–1900), Moonlit Seascape With Shipwreck (1863), oil on canvas, 76.2 x 59.1 cm, Private collection. Wikimedia Commons. 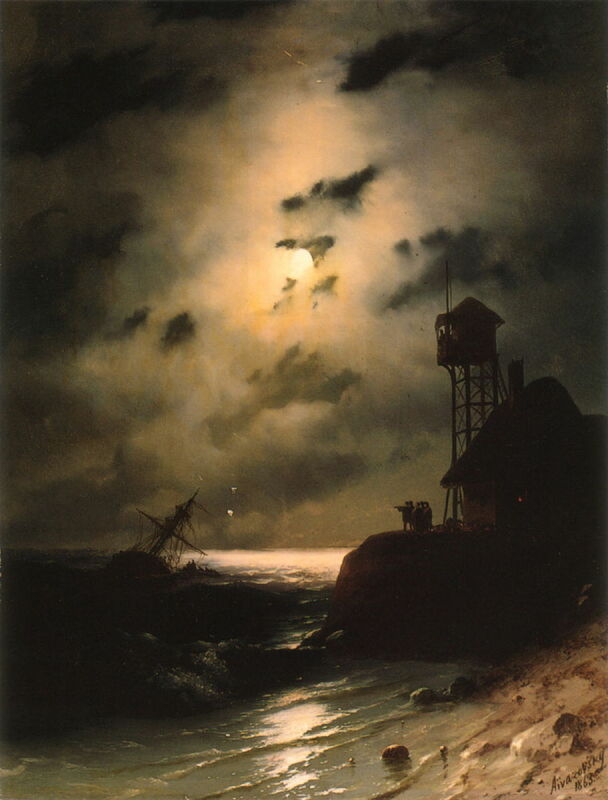 Perhaps more characteristic of Aivazovsky is his Moonlit Seascape With Shipwreck (1863), in which the crew of a wrecked sailing ship are abandoning it, in front of a lookout point. Edward Mitchell Bannister (1828–1901), Untitled (c 1868), oil on fiberboard, 24.5 × 38.7 cm, Smithsonian American Art Museum, Washington, DC. Wikimedia Commons. Among those influenced by the Barbizon School in France was a Canadian-American-Caribbean landscape artist, Edward Mitchell Bannister, whose work is now sadly neglected. 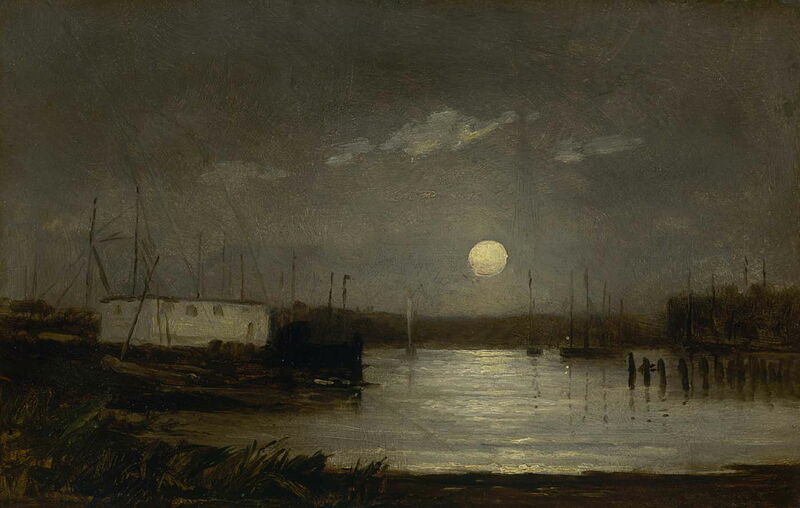 His untitled coastal nocturne from about 1868 shows the ghostly silhouettes of some small boats in a harbour. Surprisingly, given their preference for landscape paintings of the coast and fleeting effects of light, the core French Impressionists seem to have painted very few nocturnes, and I have not been able to locate usable images of any which show the coast. Édouard Manet did, I believe, paint one harbour view by moonlight. 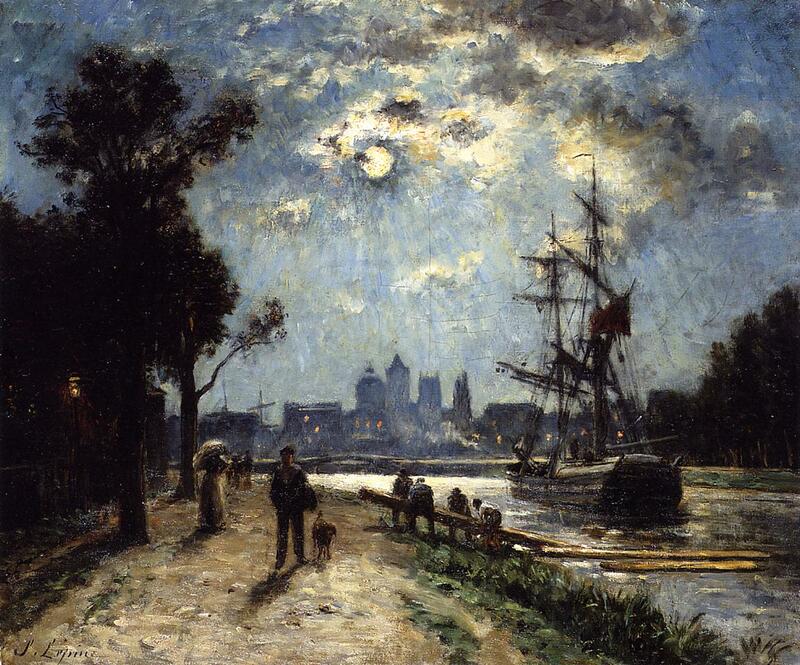 Stanislas Lépine (1835–1892), Caen, le long de l’Orne, cours Caffarelli, effet de lune (c 1876), oil on canvas, dimensions not known, Private collection. Wikimedia Commons. This is surprising, as Stanislas Lépine was one of the better-established painters who exhibited works at the First Impressionist Exhibition in 1874. Although not an Impressionist, Lépine became well known for his spectacular moonlit scenes, such as Caen, le long de l’Orne, cours Caffarelli, effet de lune (c 1876). Fanny Churberg (1845-1892), Moonlight, study (1878), oil on canvas glued to cardboard, 37.5 x 55.5 cm, Ateneum, Helsinki. Wikimedia Commons. Impressionist painters in other countries did paint some nocturnes, among them Fanny Churberg from Finland, in her wonderfully loose and sketchy Moonlight, study from 1878. She had trained in Düsseldorf, where she may well have seen the work of Friedrich and JC Dahl. John Atkinson Grimshaw (1836–1893), Whitby from Scotch Head, Moonlight on the Esk (1879), oil on card, 28 × 42 cm, location not known. Wikimedia Commons. The British artist John Atkinson Grimshaw was one of the few specialist nocturne painters of the late nineteenth century, and his painting of Whitby from Scotch Head, Moonlight on the Esk (1879) is typical of his mature work. 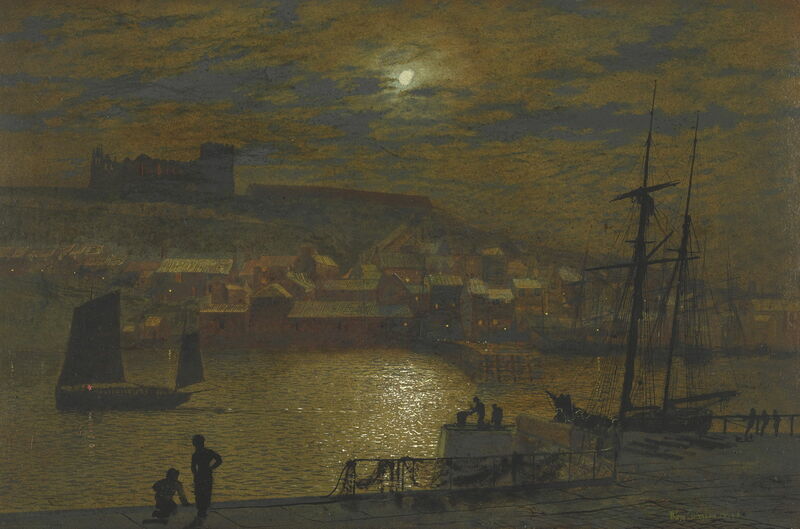 Even James Whistler, who painted many nightime and low-light works, acknowledged the quality of Grimshaw’s work. Winslow Homer (1836–1910), Moonlight, Wood Island Light (1894), oil on canvas, 78.1 × 102.2 cm, Metropolitan Museum of Art, New York, NY. Wikimedia Commons. 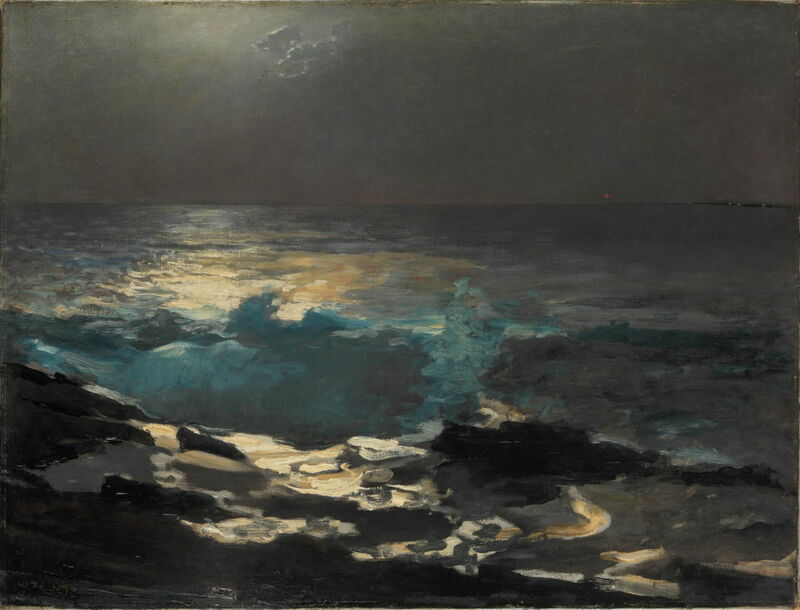 Winslow Homer painted a few nocturnes on the coast, of which his Moonlight, Wood Island Light (1894) is perhaps the finest. He has taken the established formula from Vernet to its extreme: contrasting with the large area of pale blue and ochre reflected light from the unseen moon is a tiny, weak dot of red, representing the lighthouse on the horizon. By this time, artificial lighting was starting to spread along the coasts throughout Europe and America, as shown in the white lights at the far right. Light ‘pollution’ has become a dominant issue in nocturnes, either drawing the artist to make artifical light dominant, or driving them away to remote places away from the glare of streetlights. The next two paintings, by Edvard Munch, are not landscapes, but important nocturnes which he painted at the edge of Oslo Fjord. Both are variants which have been known under titles such as The Voice and Summer Night’s Dream. 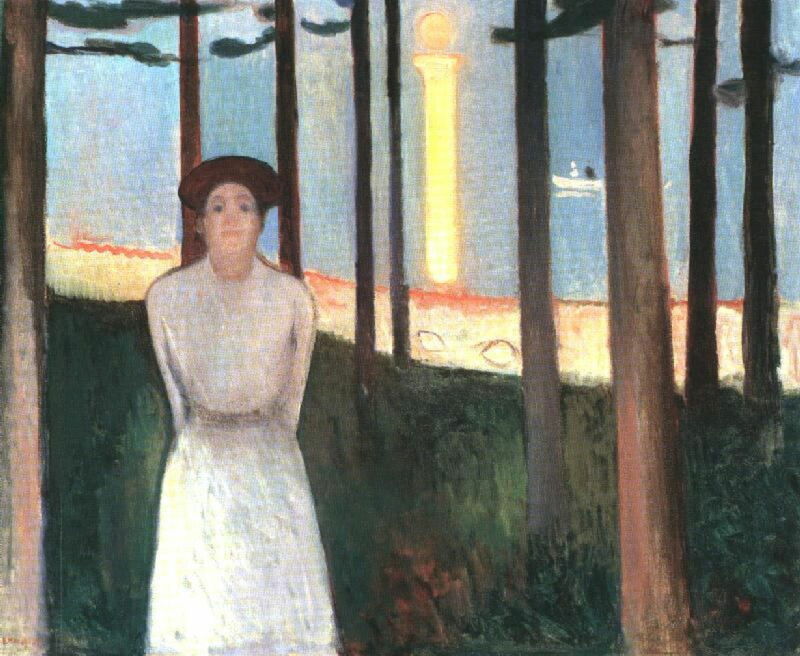 The earlier version from 1893 (above), now in Boston, shows Munch’s lover ‘Mrs Heiberg’ at the edge of the Borre Woods, to the north of Åsgårdstrand. A second and slightly later version from 1896 (below), now in Oslo, is cropped more closely and has additional boats on the fjord. 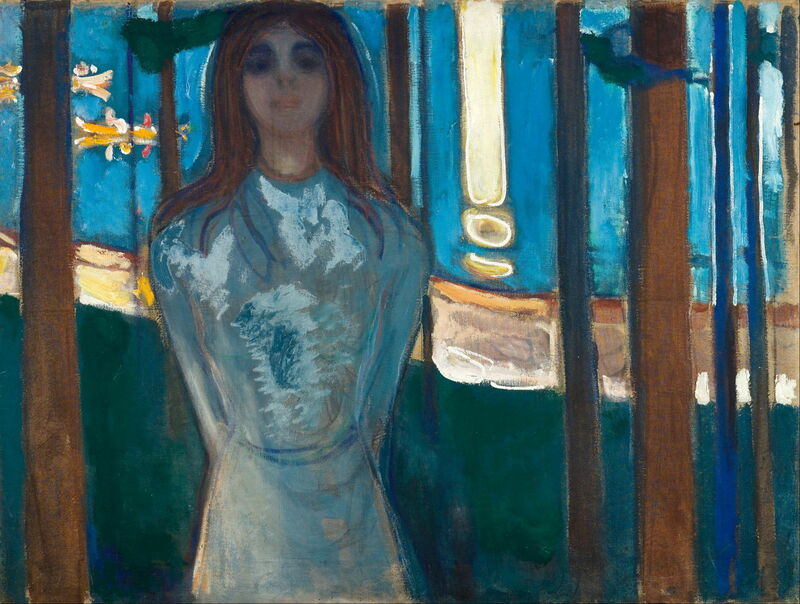 Edvard Munch (1863–1944), The Voice, Summer Night (1896), oil on canvas, 90 x 119 cm, Munchmuseet, Oslo. Wikimedia Commons. Both versions feature a brilliant golden-yellow pillar of reflected moonlight on the fjord, in the Boston version forming a distinctive ‘i‘ which reappears in other paintings by Munch. 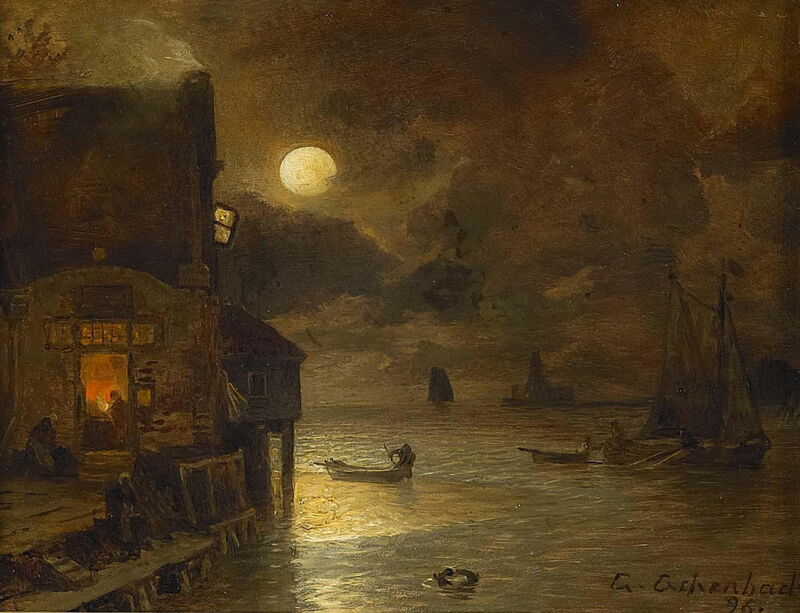 Andreas Achenbach, a German landscape specialist who is considered by some to have founded the Realist school of landscape art in Germany, painted a few nocturnes, including this of Night of a Full Moon at the Quay (1896). His brushwork is much more modern, but he uses the same device as Vernet for colour contrast, in this case the warm red light inside a building on the quay. 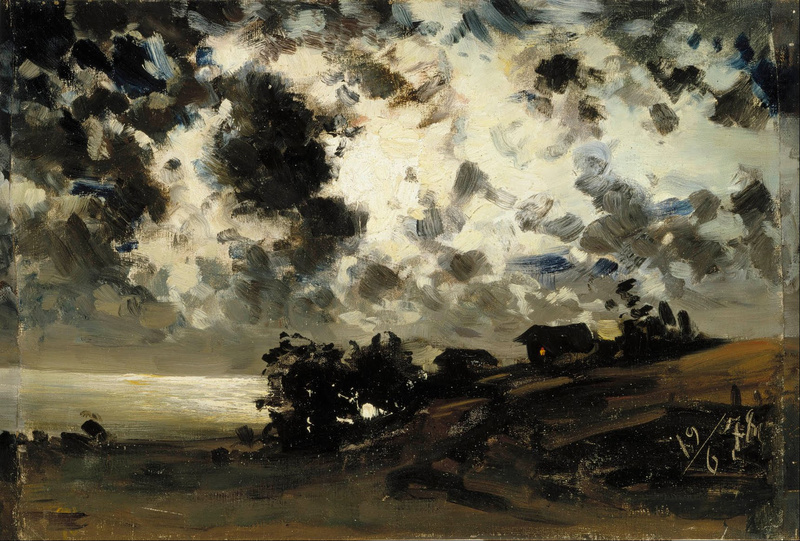 The Skagen painters, or ‘Danish Impressionists’, made some outstanding nocturnes, such as PS Krøyer’s series of beach portraits Summer Evening at Skagen Beach. 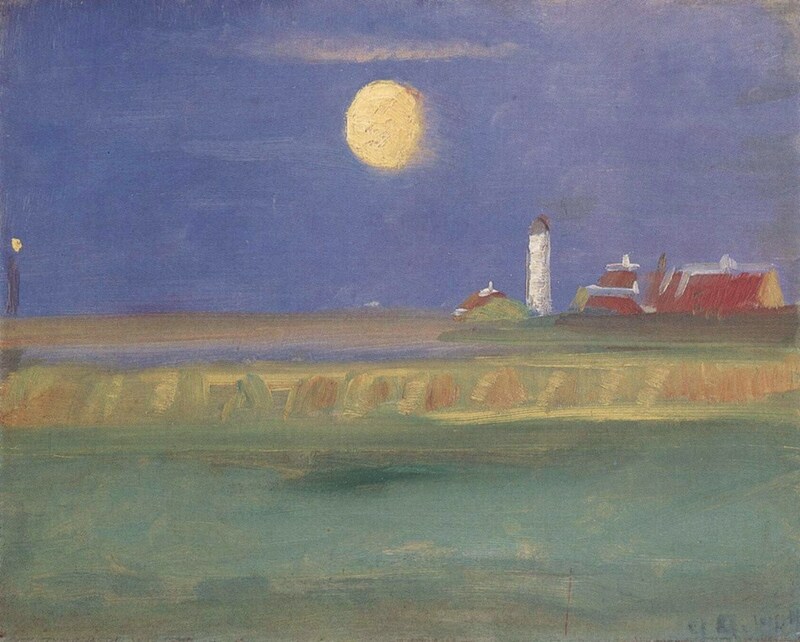 One of my favourites is Anna Ancher’s simple plein air sketch of Moonlit Evening. Lighthouse (1904), which is profoundly evocative. My final example of a coastal nocturne comes from another Impressionist, this time on the West Coast of the USA, from the brush of Granville Redmond. He seems to have painted a few moonlit motifs, including this of the Catalina Island Coast under a Moonlit Sky in 1920. Redmond became a close friend of the movie actor Charlie Chaplin, and was deaf. Catalina, or Santa Catalina, Island is about 35 km (22 miles) off the coast of California, south of Los Angeles. Redmond’s sky is formed from innumerable short, fine brushstrokes in apparently random directions, and gives the effect of the atmospheric buzz of small insects. It appears quite distinctive, and contrasts with the dark mass of rock. There is still something quite magical about these coastal nocturnes. They may be out of fashion for the moment, but at least we can still enjoy those painted in the past. Posted in General, Life, Painting and tagged Achenbach, Aivazovsky, Ancher, Bannister, Churberg, coast, Grimshaw, Homer, landscape, Lépine, Morgenstern, Munch, nocturne, painting, Redmond. Bookmark the permalink.